When the nice guys from LG's Israeli public relations office reach out and offer to send an OLED TV for a review - you say yes. Naturally, I graciously accepted and received a new 65" OLEDB6 TV. Here's my hands-on review of LG's new TV. The OLEDB6 was launched in early 2016, and is actually LG's entry-level OLED TV for 2016, alongside the curved OLEDC6. The B6 features a flat 4K WRGB (WOLED-CF) OLED panel, LG's latest WebOS 3.0 operation system, HDR support and LG's Color Prime Pro technology. The TV does not support 3D, but strangely LG did bundle a couple of passive 3D glasses with the TV. The B6 comes in two sizes - 55" and 65". Towards the end of October 2015, Workrite Ergonomics launched their first OLED lamp, the Natural OLED desk light. The Natural uses a single 320x110 mm OLED panel produced by LG (the N6BB40C panel). This panel offers 442 lumens at 13.7 W (32 lm/W), a high CRI (94) and a neutral white light - 3900K. The lifetime of the Natural is rated at 30,000h (LT70) at the lowest brightness setting. The Natural is now shipping for $239. The nice guys at Workrite were kind enough to send us a desk lamp for a review here at OLED-Info. I gave the lamp to our very own Roni Peleg to try out and write this review, which you can read below. Towards the end of 2014, Home Depot started to offer several Acuity Brands OLED luminaries, with prices starting at $199. This was exciting - as these are the cheapest OLED lamps ever, and it is the first time OLEDs are offered at a major retail channel. The nice guys at Acuity Brands sent me a Chalina 5-panel OLED luminaire (wall-mountable version) for a review here at OLED-Info. So first of all I want to thank Acuity for this. I will post a short review, focusing mostly on my experiences with this lamp, and people's reaction to it. Samsung launched the Galaxy Note Edge back in September 2014 - the company's first mass market flexible OLED phone. The Nice guys at Samsung Israel sent us a review unit a few weeks ago - and here's our hands-on review. As always this is not a full phone review - we leave those to the experts and for people that actually love mobile phones. We will focus on the display - and our experiences of having this device for a few days. The first part is written by Ron, and then Roni will give her own views. Garmin defines the Vivosmart as an "activity tracker plus smart notifications", which is really to say "an almost-smartwatch fitness band". Which it is. The Vivosmart is indeed a fitness band that can display steps, calories, distance and all the other fitness staples. On top of that, it can also perform basic smartwatch tasks like receive vibration alerts for phone calls, text messages and emails. How well does it do all those things? We'll get to that. A few weeks ago, LG Electronics in Israel were kind enough to send me a 55" curved OLED TV (the EA9800, or the 55EA970Y as it is called in Israel) for a review on OLED-Info. So first of all - thanks guys, that was very cool of you! LG released this OLED TV back in August 2013. It's been reviewed repeatedly since, with one apparent conclusion: that this TV offers the best image quality ever! So to get it out of the way - yes, It really does! The TV, even to my non-professional eyes, offers a superb viewing experience. LG now offers even newer TVs (the 55’’ curved FHD 55EC9300 and the 65’’ 4K curved 65EC9700) that can supply a superior image quality, but sadly haven't yet arrived in Israel. A few weeks ago I learned that LG started to market the G Flex smartphone here in Israel. I contacted LGE and they got the Israeli carrier Partner to send me a review unit. First of all - thanks guys! So I switched phones, left my new GS4 behind and started using the G Flex. Here's a short hands-on review of this phone. Or actually, this isn't a real review - I mostly want to discuss the screen and my experience with this phone. There are many good reviews of this phone online already (here's Engadget's for example). I won't be showing you a video of how it flexes a little - it's been done. OLED is a unique lighting technology - it enables flat, diffused planar lighting panels. These panels are different to the point (or line) sources we're used to - incandescent, fluorescent, CFLs and LEDs. 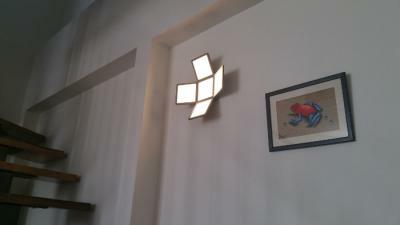 But you can also use LEDs to build planar lighting panels. Several companies are offering such solutions called edge-lit panels. Israel's OREE developed proprietary technology that enables them to offer panels which are so thin that they are quite similar to OLED panels in form (almost... more on this below), yet are efficient, very bright and a lot cheaper than current OLEDs. They were kind enough to invite me to their offices for a visit and also sent me a couple of samples for a review.